An adventurous journey which covers most of the best parts of Tibet. Truly a fabulous journey which offers awesomely beautiful rock formation, Cascades and canyons slightly hidden under the thin mists. With numerous high passes with stunning views of the picturesque landscape, tranquil lakes, rural villages, large meadows with nomad camps scattered all around the overland trip is one of the best in short duration. Enriched by the ancient most lavishly decorated monasteries and temples with chanting saffron colored monks, ever smiling faces of people and their typical lifestyle all contribute to this trip a memory of your lifetime. A land so rich in culture, tradition and steeped in religion with its unique landscape cast an enchanted spell that holds you in thrill and excitement. A sweeping panoramic flight over the mighty Himalayas includes the breathtaking views of Everest and Makalu. Truly a fabulous journey with scenic drive including a visit to the world's highest Monastery at Rongbuk and the Everest Base Camp. Great scenery of Himalayan chain of mountains, colorful Tibetan culture, and religion, visit of famed monasteries including Potala Palace, an opportunity to be at the foot of world's highest peak Mt.Everest. Day 06: Drive to Gyantse ( 3950 m ). 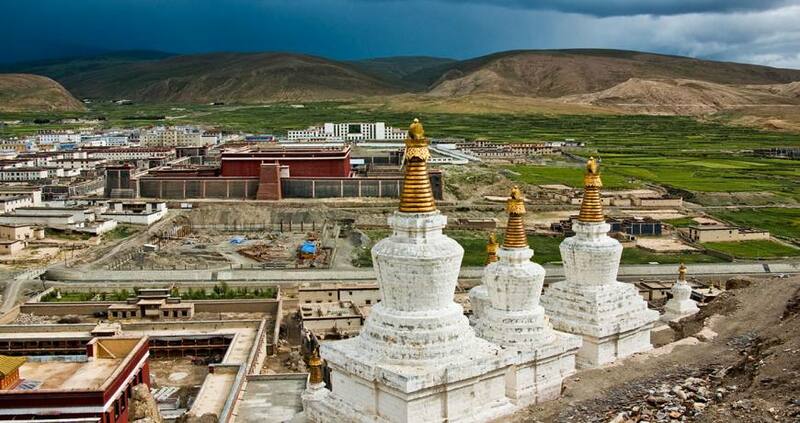 Visit Kumbum Stupa and the monastery. Day 07: Drive to Shigatse. Visit Trashilumpo monastery. Day 08: Drive to Old Tingri. Day 09: Drive to Rongbuk and visit Everest BC and return to Old Tingri. Day 10: Drive to last Resort via Zhangmu. Day 06Drive to Gyantse ( 3950 m ). Visit Kumbum Stupa and the monastery. Day 07Drive to Shigatse. Visit Trashilumpo monastery. Day 08Drive to Old Tingri. Day 09Drive to Rongbuk and visit Everest BC and return to Old Tingri. Day 10Drive to last Resort via Zhangmu.